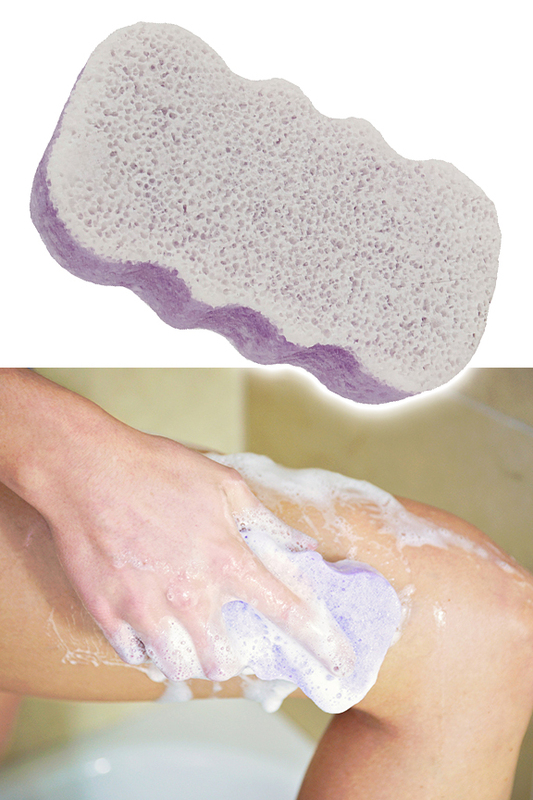 A thick, ergonomic sponge with built in body wash and a buffer to exfoliate. Brighten up every day when you wash with Spongeables. 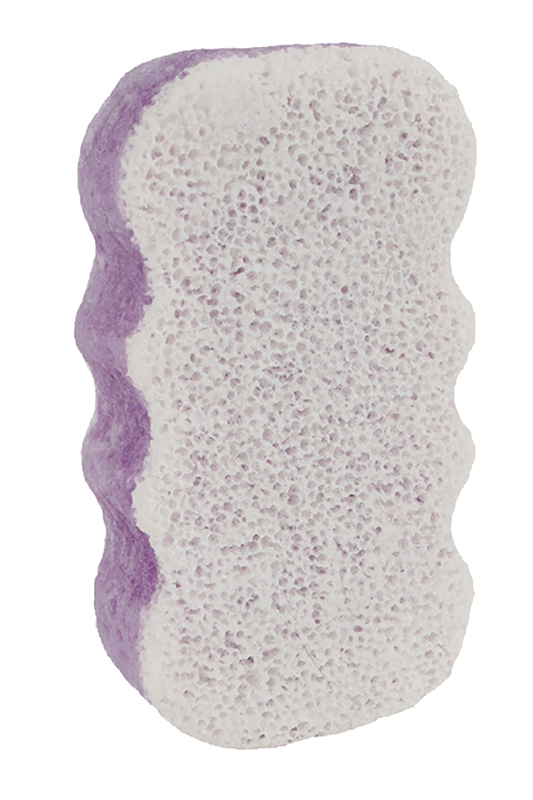 This large sponge feels comfortable in your hand and offers at least twenty uses before the suds run out. After that, you can still add your own soap or shower gel to keep using it, but the creamy lather provided by the premium ingredients is usually missed. As you wash, it provides 4-in-1 benefits by cleansing, exfoliating, moisturizing and massaging with each and every use. The curvy edge makes it easy to hold, and the dual sided design makes it extra useful. Wash like normal with the softer, purple side, or scrub and rejuvenate with the more rough, white side. The patented technology infuses soap as the sponge is manufactured, so you simply get it wet with water to activate, and squeeze gently to create foam. Pamper your skin with this spa quality cleaning tool, and exit the shower feeling cleaner than ever. You won't even need to apply lotion when you finish because the integrated moisturizers will leave you feeling soft and hydrated. Prefer a smaller size? Want to try it at a lower price? Check out the 5+ travel size sponge for all of the same material and ingredients, but in a smaller size that costs less. Great for the whole body, but especially useful for the dry or cracked skin that is commonly found at the feet or elbows. Use the buffer side to smooth rough skin, and as you do it, Shea Butter and olive oil will moisten the area. This exfoliating side can help you get a better shave, reduce the effects of aging, or hasten the repair of damaged skin. As you use it, dead cells will be dislodged and removed, allowing new ones to take their place as the whole area recovers. As we age, new pigmentation often surfaces in the form of sun spots, liver spots and skin tags, but when used properly, this handy sponge can eliminate or reduce the appearance of most of those issues. Simply wash like normal, but utilize both sides as necessary and you will be left with more youthful looking skin that feels wonderful to the touch. Get into shower or bathtub and wet your body. Saturate the sponge until all the way wet. Use the softer side for regular cleaning, or turn over to the scrubby side to deep clean and exfoliate. Dimensions 5.25" x 3" x 1.5"
Integrated Buffer Yes - White side gently exfoliates to rejuvenate skin. Ergonomic Shape Yes - curved exterior and thick sponge make it easy to handle without strain. More than two weeks worth of shower gel is infused into this spa quality sponge. Get your skin cleaner than ever while reducing effort at the same time. Use the soft side for general cleaning, or flip over to gently exfoliate. Order Yours Today! I used to buy these at Ulta but couldn’t find them anymore. I was so happy to find them online. They smell great and really smooth out dry skin like on elbows and heels. 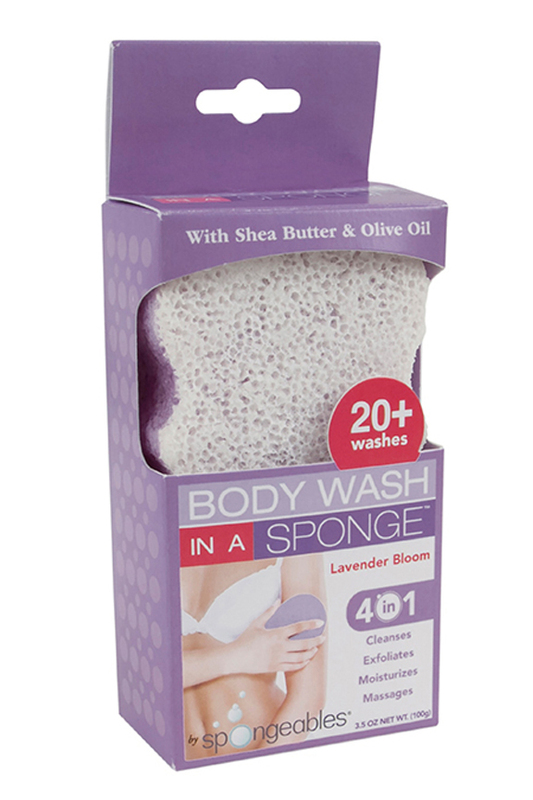 This sponge is also great for exfoliating dry legs. And yes each sponge does last for 20 showers! I love this product. It exfoliates the body so it feels so smooth. The sponge fits in your hand for a good grip. I will buy more when I run out. The fragrance is different from the one i bought at the store. It is a very thick sponge. I like the smaller better which i can manage better. Awesome for extoliating, wonderful scent. The sponge is great in the shower. It is long lasting and has a great fragrance. Skin feels nice, clean and refreshed. just love the sponges make you feel so clean a pleasure to use. Gave a few to friends they love them also will be ordering more when run out.Thankyou for a great product. I bought this item for my daughter who was going on a cruse, also got her husband the one for men. They really liked them so I got them more for stocking stuffers. I truly am enjoying my sponge with buffer. The body wash makes my skin so soft and refreshed and using the buffer is a plus to clean off dead skin and revitalize. I have one put away for a gift which will be much appreciated. I will surely be ordering more. Originally found them at a discount store. After being unsuccessful several times in finding them again, I liked them well enough to go online and search them out and found the website. The first order took forever because they were sold out. This last order arrived within days. I am very very happy with this last order and with the product! These soapy sponges are my new favorite thing! They smell awesome, lather up nicely and make me super clean! Quality product except that it is made from too many chemicals. I was really amazed how much soap was in this sponge, once it got wet it was smooth on my skin and the rose fragrance was soft not over powering. I will buy this product again. I LOVE THE LAVENDER SOAP SCRUBS , THEY MAKE PERFECT GIFT TO ALL MY FRIENDS . ALSO IF i VISIT SOME ONE IN HOSPITAL THEY ARE A GOOD THING TO GIVE . THANKS SO MUCH , MY NEXT ORDER WILL BE THE MEN 'S SOAP PADS . I received what I ordered in a short amount of time. It was received in good condition, because it was packed well. Could not ask for more. Thank you. My 13 year old daughter has been using this Spongables for a few years. They smell wonderful. They last way way longer than stated. This one has a scrub side which is nice too. They start off very stiff, but get soft. They are loaded with soap that is why this happens. She also likes the other scent too, that one is all sponge with no scrub. Both are really really nice scents. I always buys these and keep back up for my kids. Hard to find them in stores. I hope they keep this Sponagables brand available here. My son uses the men's one too. can I order five travel size?